We all know we should be brushing more diligently several times a day, but without our dentists regularly shaming us into better oral hygiene, that rarely happens. 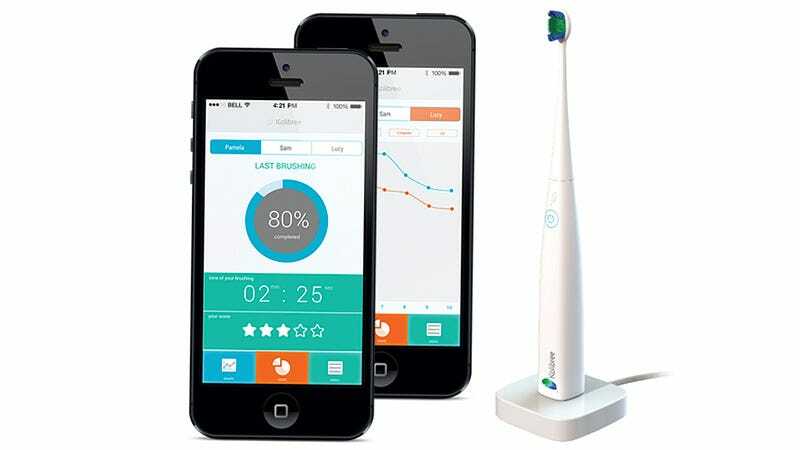 So a Paris-based company called Kolibree has created what it claims to be the world's first app-connected toothbrush that will encourage better brushing habits between dentist visits. The toothbrush may look like your run-of-the-mill electric model, but it's been enhanced with a wireless Bluetooth connection that lets it report your brushing times and habits to an accompanying app. Not only does this give a user insight into how long they actually brush versus how long they should be brushing, it also allows oral hygiene to be turned into a game to encourage kids to stay on top of tending to their teeth. And the company intends to make the collected data available through an API letting other developers create brushing-based games and other applications.